Easily machined with standard shop equipment. Can be turned, drilled and shaped. Produces sharp, detailed parts with close tolerances. 902 provides excellent electronic, mechanical and thermal properties and will not out gas in a vacuum. Applications Include: electrical insulators, furnace components, brazing, soldering, welding fixtures, thick and thin film applications, R.F. heating fixtures, prototype ceramic components, etc. Dense and vacuum tight. 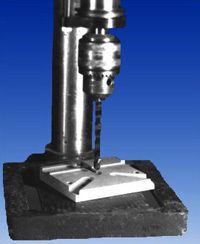 Machines on conventional shop equipment and standard cutting tools. No post machining heat treatments are required. Offers high impact and mechanical strength and low thermal conductivity. Ideal for vacuum feed thrus, electrical and vacuum needs, electrical parts and can be metalized for soldering applications. Dense and vacuum tight, glass ceramic composite with “0” porosity. No heat treatments are required. Can be ground, sawed, turned, tapped, milled and drilled, etc. Offers excellent electronic properties, even at high frequencies. Ideal for critical medical and vacuum applications, for insulators with high dielectric strength and chemical resistance. Provides the chemical, thermal and electrical properties of standard high purity alumina ceramics. Can be machined with standard shop equipment. No heat treatments are required. Now 96%, high Alumina parts can easily be made with the convenience of an "in house" process. Ideal for applications in electrical, electronic, metallurgical and vacuum industries. 310M Ceramic foam is composed of over 99% pure Fused Silica Ceramic and offers low thermal expansion and conductivity, high thermal shock resistance and high thermal reflectance. It is easily cut, sawed and drilled. 2000ºF, white hot, parts can be immersed in water with out cracking. Resistant to: oxidizing and reducing atmospheres, molten metals, steam, corrosive gasses, most acids, chemicals and solvents.